Chicken marsala is a classic Italian restaurant dish. 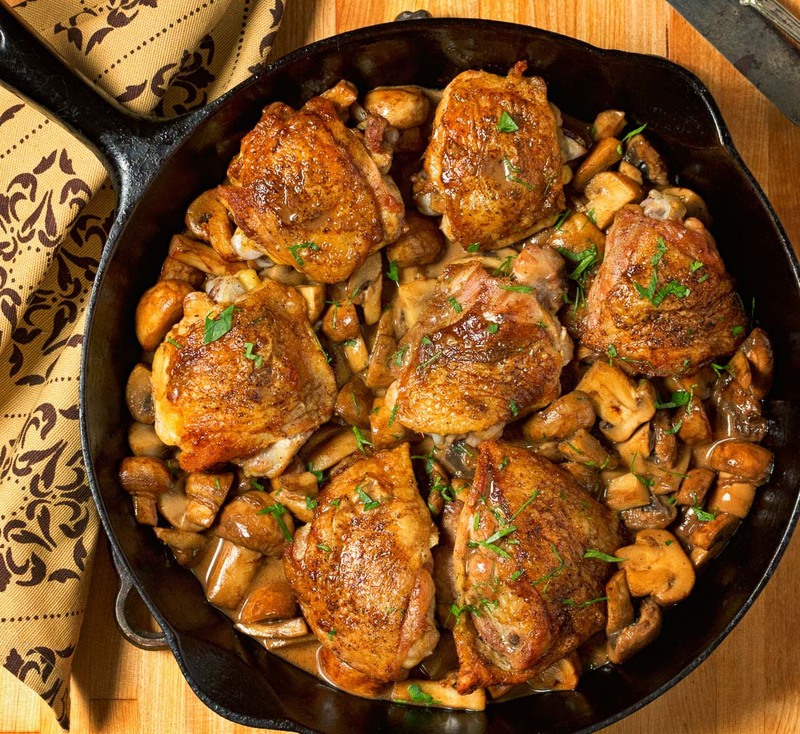 Pound some chicken flat, flour it up, fry it up with some mushrooms and douse it with marsala wine. Not bad. Not great. And more work than it’s worth. Why not do away with the scaloppine? Go in a more rustic, hearty direction? Bring it into cacciatora territory? I bet that’s where chicken marsala comes from anyway. Italian home cooking five hundred years ago. I say let’s go back. This is a family style dish but all the elements are the same. Dust the chicken in flour. Sauté the chicken to brown it. Use the rendered chicken fat to fry up the mushrooms. Roast the chicken to finish cooking it. Deglaze with marsala wine. Add some stock and a bit of balsamic vinegar. Serve the chicken over the mushrooms. I don’t think you even need to serve it with sides. Maybe a bit of polenta but nothing more. Simple, rustic, delicious. This is rustic chicken marsala. Use skin-on, bone-in chicken for best results. In a small sauce pan, reduce the stock by half. This will save time and help keep the chicken hot later on. Season the chicken with salt and pepper. Dust the chicken with flour. Film the pan with olive oil. Place the chicken thighs in the pan, skin side down and saute for about 5 minutes, until golden on the skin side. Be careful not to burn the flour. Saute the mushrooms in the same skillet, using the oil in the pan. Season the mushrooms and remove them from the skillet. Return chicken and accumulated juices to the skillet. Nestle the thyme sprig between the thighs and place in the oven. Roast until the chicken reaches an internal temperature of 165F. 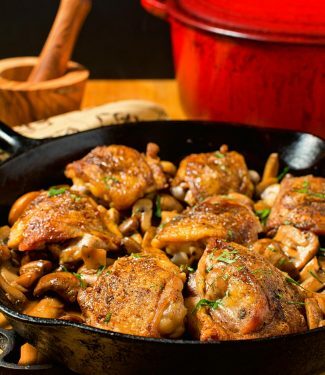 Remove the chicken from the pan and deglaze with the marsala wine, scraping up any fond in the pan. Add the stock and reduce slightly. Add the balsamic vinegar and cook a couple minutes more. Return the mushrooms and mushroom liquor to the pan. Simmer until the mushrooms are heated through. Off heat, stir in the butter, one tablespoon at a time. To serve, place mushrooms on the plate. Place two chicken thighs overtop the mushrooms and drizzle the sauce around the chicken. Simple, delicious and beautiful. Looks like my kind of recipe! Chicken thighs have always been my favorite, I have a thing for dark meat, and I really don’t think I could ever eat enough mushrooms. Definitely making this chicken marsala sooner rather than later, thank you! It’s a lot of good flavour without too much work and much better than the usual marsala I think. I hope you like it! I love a good chicken marsala! Your version looks like classic deliciousness! I don’t usually add balsamic vinegar to mine, but that’s a great idea! I’m sure it adds a really nice depth of flavor. I’ll definitely try it! Thanks, Romain! You are very welcome. I hope you like it. A bit of balsamic really does elevate the flavour of this chicken marsala. This version of marsala looks heartier and less muddled than what you’d get at a restaurant these days. I love how crispy the chicken skin looks. And it’s minimal ingredients, so definitely a winner in my book! I find good Italian home cooking tends to have a fairly short ingredient list. Focus is on doing it right rather than hiding behind a bunch of different flavours. Oh yes! I love the way you make this recipe inviting through your awesome food photography. I have never before have I heard of chicken marsala but the way you describe it sounds like a recipe my grandmother used to make. Timeless, simple and classic. Oh, and yes, delicious! Thank you so much. If you make it I hope it lives up to the memories of your grandmother.